Adam Bryant conducts interviews of senior-level executives that appear in his “Corner Office” column each week in the SundayBusiness section of The New York Times. 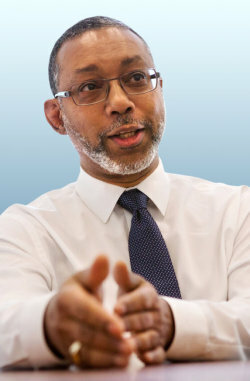 Here are a few insights provided during an interview of Kevin E. Lofton chief executive of Catholic Health Initiatives. To read the complete interview, check out other articles, and obtain subscription information, please click here. A lot of what I learned from an early age was around influence. I was involved in a lot of things. I ran track in high school, and I also played piano and competitive chess. I think people generally always looked at me as a leader, and I felt like I was having influence. People wanted to know what I had to say. I didn’t have a lot of formal leadership positions, though I was class vice president in my sophomore year of high school, during the same year that Supreme Court Justice Sonia Sotomayor was the class president. My father was an electrician. He worked two jobs when we were young. My mom was a dental assistant during most of my years growing up. She later went back to school and became a dental hygienist. My grandmother in Texas was a big influence on us, too. She was a domestic, but she was a fighter. Needless to say, it was segregated down in Texas at the time, and the street my grandparents lived on when I was little still had ditches. My grandmother led the civic effort to get the streets paved. Another influential person was the dentist my mother worked for. He treated us like we were his children, and a lot of the exposure that I got to things at an early age came through his influence. His wife, for instance, was a bass cellist in the symphony orchestra, and we would go to concerts at Lincoln Center. He actually paid for me to go to the music school that his children were in. We played in Carnegie Hall and New York World’s Fair. What was your first management role? My first hospital job was as an emergency department administrator in Jacksonville, Fla. At the time, it was the seventh-busiest emergency department in the country. I was probably 24 and straight out of grad school. I had a staff of about 250 people. That’s a big jump. How did you handle it? I realized that a big part of my job was to help people see the ultimate value of the job they do. It was also about looking at what needed to be done and not accepting any excuses. This was a county hospital, the kind of place where sometimes people accept mediocrity. I moved up rapidly because I didn’t accept that, and I got things done. At the end of the day, people really want to do the right thing. I saw my job as removing barriers and then celebrating successes. I also brought people into the process. When you bring staff into a meeting and you talk to them about the things we can do to improve, and then you actually act on their ideas and they see that their input made a difference, people will follow you. You also have to be able to relate to people, and not look down on them or talk down to them. I may have a title, but that’s not the reason that we need to do this. We’re here to do A, B and C. Here’s the way you can help with that. What suggestions do you have to make it better? Those are the secrets to success. Were you ever nervous about all that responsibility at such a young age?